“It is a huge network of NGOs, nursing homes, doctors and middlemen dealing in illegal adoption and baby trafficking that the police have busted. Our men are now building on the huge leads they have already got in this case,” Rajesh Kumar, CID’s Additional Director General told the press. Additionally, investigators believe foreigners were buying the children. Currency from other countries was found at the same time the children were discovered. Several corpses and skeletons of infants were also unearthed in the raided businesses. 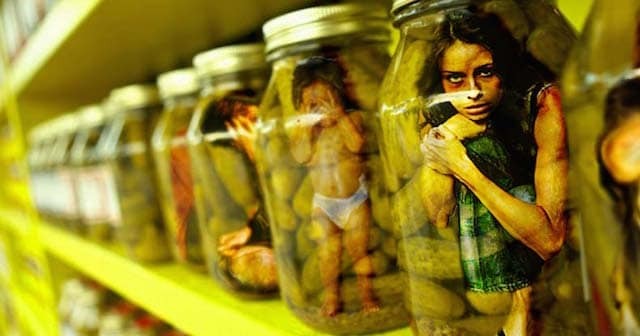 Child trafficking is on the rise in the U.S. In 2006, a woman living in North Carolina, Mercedes Farquharson, fled the country when it was discovered she’d been using two young girls as house slaves, forced to farm the land, and do all the household chores, along with cooking and cleaning. In 2009, she was arrested in Bulgaria, where she’d fled to escape justice. The trafficking of children isn’t limited to lowly child-protective service workers either. Hama Amadou, an opposition leader in the Sahel state of Niger was sentenced to one year in prison for providing babies to Niger’s elite society. “Prosecutors claim that Amadou was one of a group of people accused of smuggling babies from Nigeria via Benin to wealthy couples in Niger by falsely claiming the parenthood of around 30 children,” according to Deutsche Welle (DW), Germany’s international newsgroup. Childlessness is Niger is looked down upon, so one way the elitists solved their own infertility problem was to take someone else’s child as their own.